The athlete and the goal will always dictate the training and nutritional program. Each athlete is unique, and so should their program reflect that. For the sake of our discussion, we are going to be only looking at those who have aspirations to compete in the sport of CrossFit. With that being said, we need to look at the tasks and training that go into competing in that sport to dictate what type of fuel sources will serve them best. The sport of CrossFit includes a wide range of tasks that include but are not limited to: Absolute strength lifts, strength speed maxes, extended aerobic power, barbell cycling work at low and high loads, high power glycolytic work, middle zone glycolytic/threshold work, varying muscle endurance contractions, CP-battery contractions to name a few. When looking at these, we see a broad spectrum of energy demands on the athlete. Without going down a rabbit hole of what defines high intensity and how that varies for everyone, suffice to say the sport of CrossFit presents tasks that demand ample amounts of energy and output from athletes. With that being said, we are going to need specific nourishment to fuel those tasks and recover from them effectively so we can do them again tomorrow. The maximum rate of ATP synthesis, the body’s ability to produce more energy, from fat oxidation (breaking down fat via oxygen) is about 0.40 mol of ATP per minute. In comparison, ATP synthesis from glucose oxidation can generate 1.0-2.0 mol per minute; roughly a 2 to 5-fold difference (1). During CrossFit style training, the rate of ATP synthesized from free fatty acids cannot match the rate of ATP needed to fuel muscular work. Further, if an athlete became fat-adapted, where the body was preferential to utilizing fat for fuel, there would be a decrease in pyruvate-dehydrogenase activity. This enzyme is the first step in the process of linking the glycolysis metabolic pathway to the citric acid cycle (TAC). The TAC is the step before oxidative phosphorylation (electron transport chain) where we create the largest amount of ATP, 30 to 36 ATP’s yielded from 1 glucose molecule. Why is this important? Decreased levels of pyruvate-dehydrogenase will impair rates of glycogen breakdown (2). This will reduce glucose availability to fuel training (3). As Alan Aragon states, “Becoming fat-adapted results in being carb-impaired; it’s not an ideal physiological trade-off.” And continues, “This is why low-carb/ketogenic diets can be detrimental to sports that require continuous or intermittent high-intensity efforts” (read: CrossFit). Knowing now that carbohydrates are the most preferred and efficient source of fuel for the body for the sport of CrossFit, let’s look at prescriptions around carbohydrate fueling. It’s worth repeating, all training and nutritional prescriptions need to be individualized as everyone is unique and will have differing demands. So, don’t take these as gospel but as general ideas for prescription. First, we want to find out what the caloric demands are for the athlete. That will give us an idea of how much food they will need to be intaking, first, before we start to give percentages of macronutrients. For each athlete, it would be prudent to start on the lower end of caloric intake to see how the body handles that amount of food. From there, titration of calories over a week period would be a prudent approach if more is needed. Before adjusting macronutrient intake, the pieces you always want to be monitoring are: sleep quality and quantity, training quality and results, mood, digestion, arousal, energy throughout the day, bodyweight, and inflammation. Those KPI’s (key performance indicators) will ensure the athlete is moving in the right direction and the fuel they are intaking is on point. When looking at amount of carbohydrate intake per day, this can vary drastically depending on a multitude of factors: how lean are they, how much training are they doing on a weekly basis, how much training are they doing per day, what type of sessions are they doing the most in their week, how old are they, what gender are they, what’s their heritage/background (just to name a few). All of these questions are going to dictate how much and how well they will handle carbohydrate intake. Let’s remember, we are discussing this with the CrossFit athlete in mind who for the most part will be training twice a day multiple times per week. *This should give you an idea of the type of work an athlete would be doing who needs to be consuming over 400g of carbohydrates per day (male athlete in the training example above). We would consider this the higher end of the spectrum with regards to training volume and amount of carbohydrates consumed per day. *Take this in context; 4-6 hours of intense work, Tour de France riders as an example, who will need upwards of 1000g carbohydrates to refuel, maybe more. Worth mentioning to give perspective on how valuable and important optimal carbohydrate intake is for sport performance. We need to understand the goal and the athlete before we start to think about what fueling will be necessary. Once that is known, we can then look at what goes into that sport. 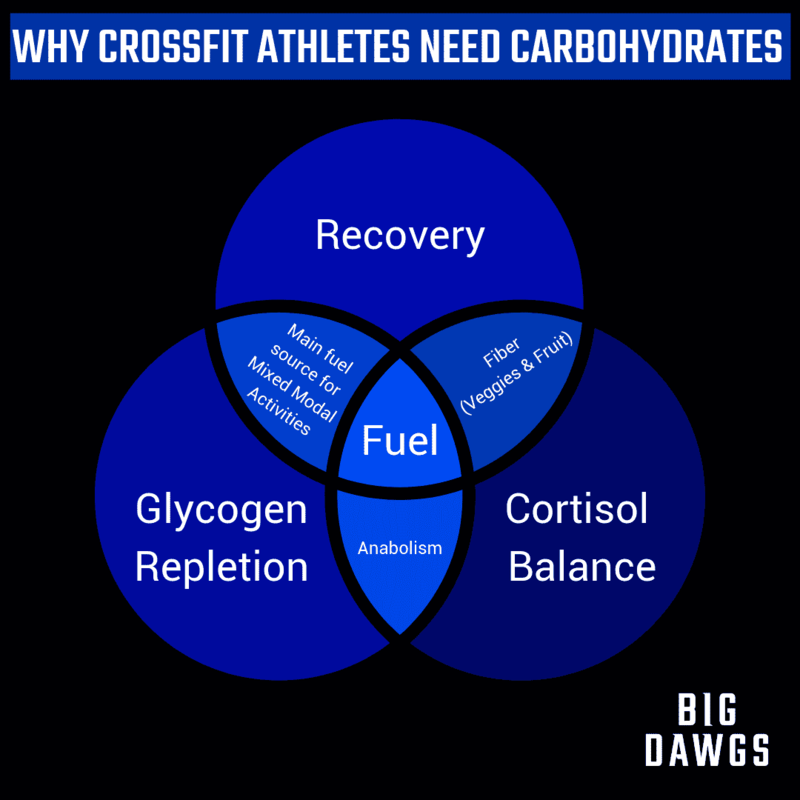 With the CrossFit athlete in mind, we know the sport demands a broad range of metabolic tasks that will require adequate resources to fuel and recover from. We know from research that ATP synthesized from glucose is roughly a 2 to 5-fold increase in ATP per minute (1-2.0 mol per min) compared to fat oxidation (0.4 mol per min). We know from research that becoming fat-adapted results in being carb-impaired, which becomes a poor physiological trade-off when considering the demands of the sport. We know the daily caloric demands for these athletes will be higher to promote recovery and growth. By extension, carbohydrate intake will be making up close to half, if not more, than their daily caloric intake. Before we blindly add more carbohydrates, remember to monitor the major KPI’s: sleep quality and quantity, training quality and results, mood, digestion, arousal, energy throughout the day, bodyweight, and inflammation. These pieces will give direct feedback on how the body is responding to the stress it is imposed and how well it is recovering. This will dictate the direction fuel utilization needs to go for the athlete. Lastly, everyone is unique and their prescriptions must reflect that.